Our new year here at Brooklyn & Boyle, the small, grass-roots art, culture and community paper with a big heart, has started off with some very noteworthy reasons to celebrate. Firstly, award-winning filmmaker, writer and director Miranda July enthusiastically mentioned Brooklyn & Boyle in January's first New York Times Sunday Review of Books when she was asked during an interview about what she was going to read next. While we don't know the artist personally, we are pleased and grateful that she would take time to check out the little paper that cares about local artists and preserving neighborhood integrity, even as many of our neighborhoods are changing and many struggling, long-time residents are, unfortunately, being displaced. 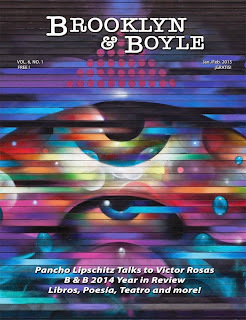 Of course, just two short weeks later, Brooklyn & Boyle was mentioned in a lecture at the prestigious 2015 L.A. Art Show held at the downtown LA Convention Center by an important curator at the Long Beach Museum of Latin American Art. A cover story on the MOLAA was featured on a large Powere Point projections screen. Imagine our delight and surprise when we saw the Facebook and Instagram images! However, the most important news, in our humble opinion, is the decision to combine our January and February issues. This has occurred for two reasons: 1) We'd like to put together a 2014 Year in Review and have needed a little extra time to examine the many important stories and issues we saw and faced together during a tumultuous year, beginning in our own particularly special Greater East Side, Los Angeles as a whole and in the rest of the world; and 2) We would love to finally have our monthly publication schedule coincide with the beginning of the month as is should be. 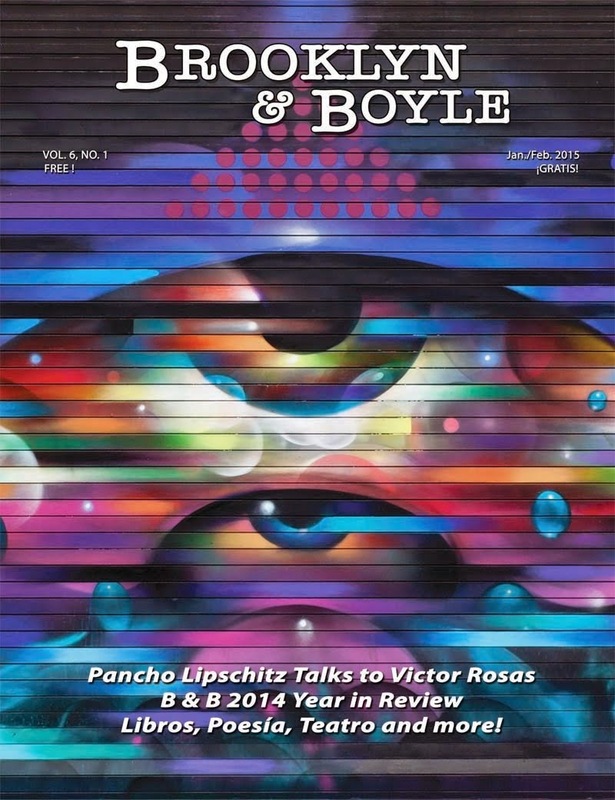 We are excited about the upcoming issue, which features a cover by graffiti artist Vyal Reyes, whose mural in Little Tokyo evokes the "all-seeing eye." The Jan./Feb. 2015 issue of Brooklyn & Boyle will also feature a story on the New Americans Museum inaugural exhibition. The new So-Cal cultural facility will be dedicated to those "Pursuing Dreams, Creating America's Future." Art scribe Pancho Lipschitz interviews trickster artist Victor Rosas for a humorous and provocative result. As always, we bring you books, theater and music that looks more like you and me. This month, look for a review of the new book, Twilight in the City of Angels and news about a great new play by Josefina Lopez and Kathy Fischer called Clean Start. We hope 2015 will be a year of growth and even more exciting changes as we make our best effort to keep bringing readers and sponsors the kind of East Side journalism and community news that we can all be proud of. Si Se Puede! rings as true now as it ever did. If it were not for the work of those who lived by that slogan, we would not be here. Feliz año a todos!